Plaza Restaurant may be small in size, but not in taste. One of the best table service values at Disney World! 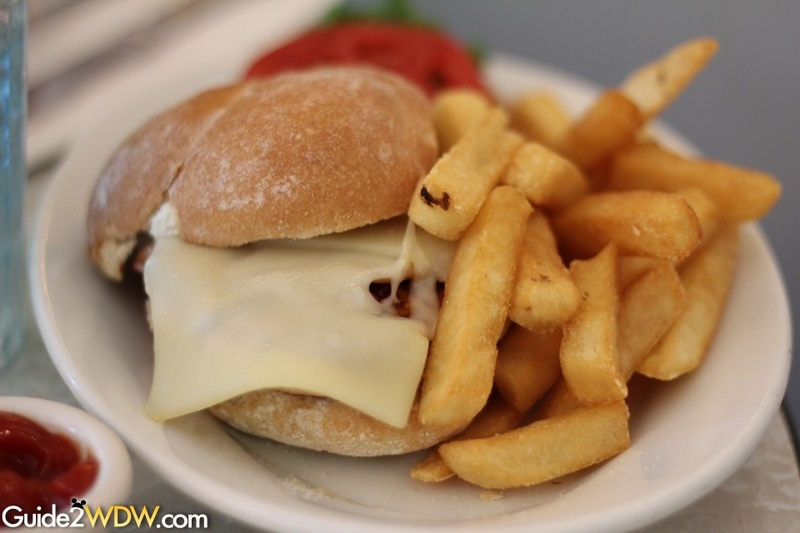 The Plaza Restaurant can provide a pleasant break in your tour of Magic Kingdom. The menu includes freshly made burgers, cheesesteaks, and grilled sandwiches. Want a change-up from traditional park fare? Try a Grilled Reuben or Plaza Club sandwich. Be sure to save room for dessert, which is provided by the nearby Plaza Ice Cream Shop. For those counting calories, the Chicken Strawberry Salad or Veggie Sandwich provide healthy options. To be honest, I completely missed the Plaza Restaurant on my first few trips to Walt Disney World. It’s very easy to pass by on the way to Tomorrowland or Cinderella Castle. However, after finally stopping by and enjoying a sandwich and a sundae, this became my favorite place to eat at Magic Kingdom (until I tried Be Our Guest). The Grilled Chicken Sandwich was delicious, and the brownie sundae can still make my mouth water whenever I think about it. The Chicken Strawberry Salad is also highly recommended. Because seating at Plaza Restaurant is limited, this dining stop almost always seems to require an Advanced Dining Reservation. The tucked-away eatery is worth planning ahead for. Be sure to make an ADR and enjoy! All sandwiches are served with your choice of Broccoli Slaw, Homemade Chips, or French Fries. Ice Cream Flavors: Chocolate, Vanilla, Strawberry, Mint Chocolate Chip, Cookies and Cream, No Sugar Added Raspberry Sorbet, No Sugar Added Butter Pecan, or Nonfat Chocolate Vanilla Swirl. Note: Menus for Disney World restaurants change on a somewhat regular basis, so the menu listed above is subject to change. For the most up to date menu, check out Disney’s official Plaza Restaurant menu.